"No question, Kim Jong Un won 2017," according to Jeffrey Lewis at the Middlebury Institute of International Studies at Monterey. In January, Trump used his Twitter pulpit to vow he would never let North Korea develop a nuclear weapon capable of hitting the United States. However, since then Kim has demonstrated large leaps down the road to achieving this goal. The past 12 months saw North Korea test its most powerful nuclear weapon to date, a massive detonation it claimed was a hydrogen bomb, as well as launching its first three intercontinental ballistic missiles, the last of which it said could reach anywhere in the United States. To threaten the U.S. with a nuclear weapon, North Korea needs more than just a powerful rocket. It also has to build a lightweight warhead and a reentry vehicle capable of withstanding a high-speed trip through the Earth's atmosphere. Although it hasn't publicly demonstrated these components yet, some experts think it could build a nuke capable of hitting the U.S. as early as next year. Others speculate it already has. Meanwhile, in early December, a North Korea spokesman said military exercises combined with a "series of violent war remarks coming from the U.S. high-level politicians amid such circumstances have made an outbreak of war on the Korean Peninsula an established fact. The remaining question now is: when will the war break out." For all his bluster, Trump has seemed powerless to stop North Korea's technological march. "Kim may be only a few tests away from having a weapon capable of wreaking unimaginable destruction, and that is a threat, not only to Northeast Asia, but to global peace and security," said Jean H. Lee, a global fellow at the Woodrow Wilson International Center for Scholars. "North Korea is on the cusp of a nuclear breakthrough that has held the world in thrall," Lee added. "No matter how Trump spins it, this is a win for Kim, who has used the standoff as a pretense for ordering tests that have commanded the attention of world leaders — and make him look strong at home with the North Korean people." Most agree North Korea doesn't want to launch an unprovoked attack; doing so would be suicide given the scale of the likely retaliation. But it could use its bombs as a deterrent to stop the U.S. trying to topple the Kim dynasty. "North Korea is doing something that hasn't been done in years — transitioning into a mutual deterrence relationship with the United States by deploying nuclear weapons that can strike major cities in the continental United States," said Lewis, who is the director of the East Asia Nonproliferation Program at MIIS. "This is a really significant moment. Remember, it was the fear that Saddam could acquire nuclear weapons that was used to justify the invasion of Iraq," he added, referring to former Iraqi dictator Saddam Hussein. "Now Kim has done it, and gotten away with it." Trump's response has been muddled and demonstrably ineffective, according to his critics. Many of these same experts also blame the so-called "strategic patience" of President Barack Obama failing to deal with what was then a growing problem. But Trump's stratagy doesn't appear to have been much more effective. He has jettisoned Obama's measured tones in favor of matching the apocalyptic language that has long been a tactic of the rambunctious North. In August, he threatened Pyongyang with "fire" and "fury" and tweeted the U.S. military was "locked and loaded." A month later, he told the United Nations General Assembly he was prepared to "totally destroy North Korea" — a country of 25 million people who suffer more than anyone under Kim's brutal regime. While the United Nations Security Council passed tougher sanctions against North Korea on Friday, the president has not followed through on his earlier threats, however. And his ultimatums do not appear to have slowed the pace of North Korea's nuclear and missile programs. 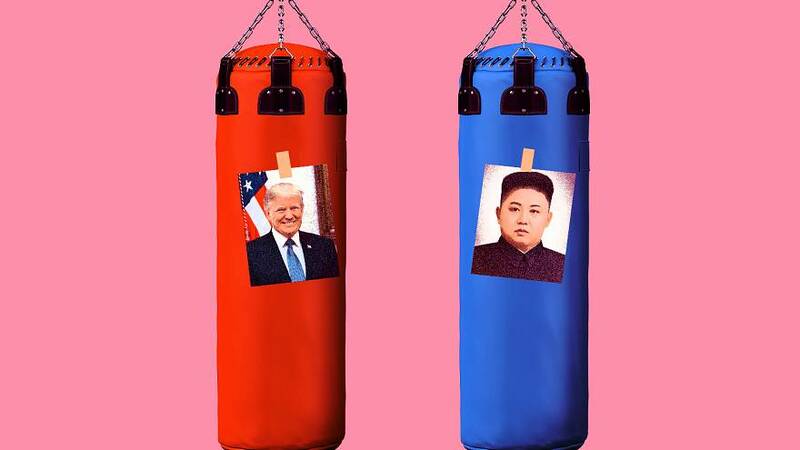 In fact some analysts say that, rather than bringing Kim to heel, Trump's combative words increased the likelihood of a misunderstanding that could lead to war. The fear is that North Korea, fresh from reading one of Trump's warlike tweets, could misinterpret training maneuvers by U.S. stealth aircraft off the Korean coast, for example, as a sign that conflict was imminent. With Seoul just 30 miles away from the Korean border, any war would almost certainly result in catastrophic civilian casualties. Confusing matters further, Trump and his team often seem to be reading from different scripts. Secretary of State Rex Tillerson and Defense Secretary James Mattis tend to offer far more nuance than their boss, at times even appearing to walk back his outspoken broadsides. Mattis — a man nicknamed "Mad Dog" because of his tough talk — said in October that "our goal is not war" and instead urged a "diplomatic solution." Tillerson too has suggested that the administration might be softening, revealing in December that "we're ready to talk anytime North Korea would like to talk." Hours later, however, the White House issued a firmer statement reasserting that "the president's views on North Korea have not changed." "Washington has seemingly lacked a cohesive approach to the challenges North Korea poses," according to Cristina Varriale, a research analyst at the Royal United Services Institute, a London-based think tank commonly known as RUSI. "This ambiguity, when coupled with the high tensions caused by regular testing by North Korea and inflammatory language on both sides, did raise the possibility of miscalculation that could lead to military action," she added. Some have speculated that Trump and Tillerson could be attempting some sort of good-cop-bad-cop routine. A comment piece in Foreign Policy magazine argued that if this is true, the ambiguity of these mixed messages might actually cause Kim to test Trump's vague boundaries — increasing the risk of the young despot inadvertently overstepping the mark. Trump has claimed some success in convincing China, North Korea's largest trading partner, to rein in its rogue neighbor. Chinese President Xi Jinping has agreed to impose some sanctions and stopped buying North Korean coal until the end of the year. However, many are skeptical that China will push North Korea as hard as Trump wants. A collapse of Kim's regime could bring a flood of refugees to Beijing's doorstep, not to mention the possibility of U.S. troops stewarding a Western-backed, unified Korea. Any moves made by Xi are likely driven by his own aims rather than any desire to acquiesce to Trump's demands. While China is indeed concerned about an unpredictable and nuclear-armed North Korea, it also wants to stop joint military exercises between the U.S. and South Korea, as well as the U.S. missile defense system recently deployed to the region. Trump and his team have called for China to impose an oil embargo on North Korea. Several analysts told NBC News that this would be almost impossible to implement. Even if it could be achieved, they said, it would more likely spark a famine than have any effect on the North's nukes. Meanwhile, in Pyongyang's corridors of power, Kim appears to have strengthened his hand. He is suspected of orchestrating the assassination of his half-brother, Kim Jong Nam, during a dramatic incident at Kuala Lumpur airport in February. On the flip side, he strengthened his inner circle in October by promoting his younger sister, Kim Yo Jong, to a top political post. Some commentators point out that Kim's short-term successes must be seen in context. Ultimately, he is the ruler of an impoverished, isolated and deeply repressive nation. An international committee found in December that Kim and members of his regime were guilty of 10 separate war crimes, relating to North Korea's network of gulags where thousands of people are arbitrarily tortured, raped and executed each year. "In the larger game, the real one which counts, Trump wins just by being the leader of a wealthy, stable, normal democracy," said Robert Kelly, an associate professor at South Korea's Pusan National University. "North Korea can survive, it can hang on, and the Kims will murder anyone they must in order to do so," Kelly added. "But North Korea is no model for anyone. It enunciates no vision of the future, nor any happiness for its people. If it is still around in 20 years, it will still be the grim, unhappy barracks state it is now. That's hardly winning." Those looking for American optimism in 2018 have found solace in Trump's comments during his November visit to Asia. "It really makes sense for North Korea to come to the table and make a deal," the president said during a news conference with South Korean President Moon Jae-in. "We did see a much calmer and clearer approach to North Korea," Varriale at RUSI said of the trip. "Although there is a long way to go before this issue stops contributing to international headlines, maybe this will set the tone for a more collected 2018 policy that can contribute to risk reduction on the Korean Peninsula." Others see next year as an opportunity for the U.S. to make up lost strategic ground. In November, Trump asked Congress for an additional $4 billion for missile defense on top of the initial $9.9 billion he had already requested. "Now we're seeing an attempt by the U.S. to play catch up," according to Thomas Karako, a senior fellow at the Center for Strategic and International Studies, a think tank based in Washington, D.C. "A 50-percent increase in missile defense spending in 2018, if that goes through, is pretty big." Any boost to this budget would likely take time to approve and implement, however, and it remains to be seen how this defensive maneuver might help neuter Kim or solve the crisis in the short term. Also in November, Trump relisted North Korea as a state sponsor of terror, a move that came as part of his so-called "maximum pressure campaign" against North Korea. Gordon C. Chang, an author and commentator, called this campaign a "sensible plan to defang the regime" and added that "we are almost surely going to see new sanctions throughout next year." "Kim Jong Un has won 2017 so far," Chang, said. "The Kimster, however, should not spend too long savoring the win. Donald John Trump this year has laid the groundwork to turn the tables in 2018." He added: "So here's a prediction: 2018 will not so pleasant for the Kim family regime."